PLEASE REFER TO THE CURRENT LITTERS PAGE FOR THE TWO PUPPIES I HAVE AVAILABLE AT THIS TIME. YOU CAN ALSO REFER TO THE FUTURE LITTERS PAGE TO SEE WHAT I HAVE PLANNED FOR THE END OF SUMMER THROUGH NEXT SPRING. I HAVE BEEN BREEDING STANDARD POODLES FOR OVER 14 YEARS AND HAVE FOUND THEM TO BE ONE OF THE MOST AMAZING DOGS I'VE EVER OWNED. 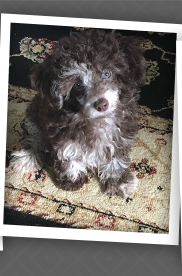 I HAVE JUST RECENTLY ADDED 2 MALE TOY POODLES AND ONE FEMALE MINIATURE POODLE TO OUR PACK TO BREED MOYEN AND TOY POODLES ON OCCASSION ALSO. 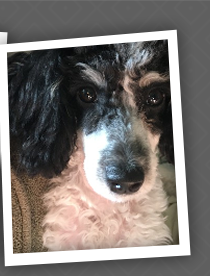 I HAVE COMPLETED YEARS OF RESEARCH ON BREEDING POODLES, INCLUDING PEDIGREES, AKC CONFIRMATION, HEALTH AND GENETICS. THE MOST COMPLICATED ASPECT OF THE POODLE THAT I HAVE FOUND IS PRODUCING DESIRED COLORS OF THE BREED. 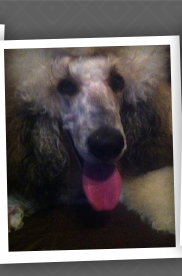 I CURRENTLY BREED TO PRODUCE A VARIETY STANDARD POODLE, MINIATURE AND TOY COLORS. I HAVE RECENTLY FALLEN IN LOVE WITH THE TRI COLORED POODLES, WHICH ARE VERY RARE AND HARD TO FIND. I AM CURRENTLY BREEDING TO PRODUCE TRI COLORED STANDARD, MINIATURE AND TOY POODLES, THEY ARE AMAZING! WE WILL MOST LIKELY ALSO HAVE A FEW CHOCOLATE MERLE OR BLUE MERLE POODLE PUPPIES AMOUNG THEM. WE PROBABLY WILL NOT HAVE OUR FIRST LITTER OF MINIATURE OR TOY POODLES UNTIL 2019 OR LATE 2018. I DO EXPECT TO BREED A LITTER OF MOYEN TRI COLORED POODLES AND MOYEN MERLE POODLES LATER IN 2018. THE POODLE PUPPY COLORS THAT WILL BE PRODUCED FROM FUTURE BREEDINGS WILL RANGE FROM TRI COLORED POODLES, BLACK AND RED PHANTOM, BLACK AND TAN PHANTOM, BLACK AND SILVER PHANTOM, CHOCOLATE AND TAN PHANTOM, SABLE, RED, APRICOT, RED AND WHITE PARTY, BROWN, CAFE AU LAIT, SILVER BEIGE, WHITE, BROWN AND WHITE PARTY, BLACK AND WHITE PARTY, BLACK, SILVER, BLUE, CREAM AND WHITE. THE COLORS OF THE PUPPIES WILL OF COURSE DEPEND ON THE POODLES BEING BREED. I ONLY BREED MY POODLES ONCE A YEAR. ON OCCASSION I WILL ALLOW A PUPPY TO GO WITH FULL REGISTRATION, BUT THIS IS ON A CASE BY CASE BASIS AND FOR AN ADDITIONAL FEE. WE DO HAVE A WAITING LIST FOR OUR FUTURE PLANNED LITTERS. 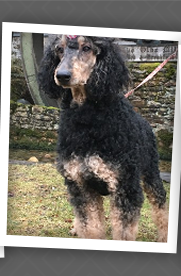 IF YOU ARE INTERESTED IN BEING PLACED ON THE WAITING LIST FOR ONE OF OUR AMAZING STANDARD POODLE PUPPIES PLEASE CONTACT ME BY E-MAIL AT PHANDMACHER@OUTLOOK.COM OR BY PHONE AT 865-221-4353. BELOW YOU WILL FIND MORE INFORMATION ON THE STANDARD POODLE BREED REFERENCING HISTORY OF THE BREED, CHARACTERISTICS, GROOMING, HEALTH AND LONGEVITY. THE STANDARD POODLE IS A BIG, BEAUTIFUL, INTELLIGENT, GRACEFUL, AND ATHLETIC. THE STANDARD POODLE WAS BELIEVED TO ORIGINATE FROM THE 15TH TO 16TH CENTURY IN GERMANY, ALTHOUGH IT WAS THE NATIONAL DOG OF FRANCE. IT IS THE OLDEST OF THE 3 VARIETIES OF POODLES, INITIALLY USED TO RETRIEVE IN HUNTING. YES, A HUNTING DOG! THE ENGLISH WORD "POODLE" COMES FROM THE GERMAN WORD "PUDEL" WHICH MEANS "SPLASH IN THE WATER". THE STANDARD POODLE WAS PRIMARILY USED AS A RETRIEVER WHICH ACTUALLY RESULTED IN THE FANCY POODLE CUTS WE NOW SEE IN THE SHOW RING. THE HUNTERS WOULD TRIM THE POODLES TO FACILITATE PRODUCTIVE SWIMMING AND TO PROTECT THE POODLE'S JOINTS AND VITAL ORGANS FROM THE COLD WATER. SO IF YOU THINK A STANDARD POODLE IS JUST A PRISSY, GIRLY DOG, THINK AGAIN. YES, THEY ARE VERY GRACEFUL, ELEGANT AND SOPHISTICATED BUT THEY ARE ALSO STRONG, STURDY, AGILIC DOGS. THEY WERE EVEN RECENTLY FEATURED ON THE FRONT PAGE OF FIELD AND STREAM MAGAZINE. THE STANDARD POODLE IS CONSIDERED THE 2ND MOST INTELLIGENT DOG IN THE WORLD. THEY ARE VERY EASILY TRAINED, HOUSE BROKEN AND EAGER TO PLEASE THEIR OWNERS. THEY CAN BE A GOOD WATCH DOG BUT ARE NOT AGGRESSIVE. THEIR SIZE AND BARK IS USUALLY ENOUGH TO SCARE ANYONE AWAY WHEN NEEDED. THEY ARE FRIENDLY, GOOD WITH KIDS AND OTHER PETS. WHEN ENTERING A NEW SITUATION OR MEETING NEW PEOPLE THEY TEND TO BE CAUTIOUS AND RESERVED AND THINK ABOUT THE SITUATION BEFORE ALLOWING SOMEONE TO PET THEM. THEY CAN ACTUALLY SEEM TELEPATHIC AT TIMES. THEY REQUIRE A LOT OF ATTENTION AND LOVE. IF THEY ARE LEFT ALONE FOR TO LONG THEY CAN BECOME DEPRESSED, TIMID AND HAVE SEPARATION ANXIETY. THE AKC HEIGHT REQUIREMENT FOR A STANDARD POODLE IS 15 INCHES AND ABOVE AT THE SHOULDER. THE STANDARD POODLE COMES IN SEVERAL COLORS AND MARKINGS. THE AKC DOES NOT RECOGNIZE CERTAIN COLORS, MARKINGS AND POINTS, BUT THAT DOES NOT MEAN THEY ARE STILL NOT BEAUTIFUL. THE STANDARD POODLE COLORS AND MARKINGS RECOGNIZED BY THE AKC ARE APRICOT, BLACK, BLUE, BROWN, CAFE AU LAIT, CREAM, GRAY, RED, SILVER, SILVER BEIGE AND WHITE. STANDARD POODLE MARKINGS INCLUDE BLACK, WHITE, BLACK MASK, WHITE MASK AND BLACK/BROWN POINTS. POINTS REFER TO THE COLOR OF THE POODLES NOSE, RIM OF EYES, LIPS AND PADS OF PAWS. OTHER COLORS INCLUDE THE PARTY, PHANTOM, BRINDLE, AND SABLE. THE STANDARD POODLE HAS BEAUTIFUL VIRTUALLY NON SHEDDING CURLY COAT. NO DOG IS PURELY NON-SHEDDING BUT THE POODLES SHEDDING IS SO MINIMAL THAT IT IS HARDLY NOTICED. ITS CURLY COAT TENDS TO HOLD ANY HAIR OR DANDER THAT HAS SHED ONTO THE COAT UNTIL BRUSHED OR WASHED AWAY. IT IS CONSIDERED TO BE THE MOST HYPOALLERGENIC OF ALL THE BREEDS. 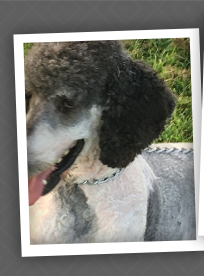 THEIR COATS CAN BE CLIPPED IN A VARIETY STYLES INCLUDING A SHORT CUT WHICH ALLOWS THE POODLE TO LOOK MORE LIKE A TYPICAL DOG. THE COAT NEEDS TO BE GROOMED REGULARLY, WHICH INCLUDES DAILY BRUSHING AND TRIMMING EVERY 4 TO 6 WEEKS. SINCE THEY ARE NON-SHEDDING, THEY DO HAVE HAIR THAT GROWS IN THE EARS. THIS HAIR MUST BE REMOVED REGULARLY AND THE EARS CLEANED TO PREVENT INFECTIONS. NAILS SHOULD ALSO BE CLIPPED WHEN GROOMING. ADDISON'S DISEASE (HYPOADRENOCORTICISM), CATARACTS, CONGESTIVE HEART DISEASE, CHRONIC ACTIVE HEPATITIS, CUSHING'S SYNDROME (HYPERADRENOCORTICISM), DISTICHIASIS, ENTROPION, EPILEPSY, GASTRIC DILATIONS VOLVULUS, GASTRIC TORSION (BLOAT), GLAUCOMA, INTERVERTEBRAL DISC DEGENERATION, LACRIMAL DUCT ATRESIA, LEGG-CALVE-PERTHES SYNDROME, PROGRESSIVE RETINAL ATROPHY, TRICHIASIS, UROLITHIASIS, HIP DYSPLASIA, HYPOTHYROIDISM, MITRAL VALVE DISEASE, OSTEOSARCOMA, PATENT DUCTUS ARTERIOSUS, SEBACEOUS ADENITIS, VON WILLEBRAND DISEASE. THE MOST COMMON ARE ADDISON'S DISEASE, CATARACTS, ENTROPHIN, EPILEPSY, BLOAT, GLAUCOMA, HIP DYSPLASIA, HYPOTHYROIDISM, VON WILLEBRAND DISEASE AND CANCER. TYPICALLY THE MEDIAN LIFE SPAN OF THE STANDARD POODLE IS 11.5 TO 12 YEARS IN THE UNITED STATES.